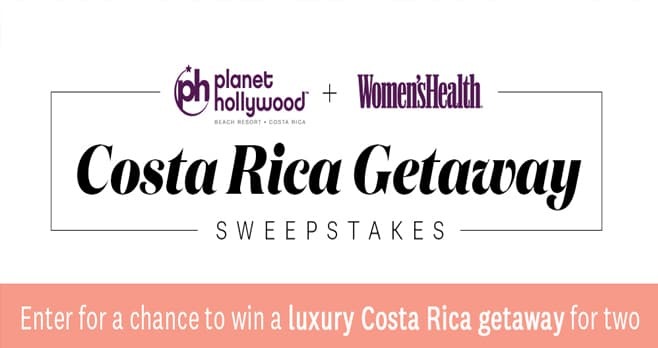 Planet Hollywood is giving away a luxury Costa Rica getaway for two with the Women’s Health Costa Rica Getaway Sweepstakes. For your chance to win, visit costarica.womenshealthmag.com and register by December 24, 2018. The Women’s Health Costa Rica Getaway Sweepstakes is open to legal residents of the 50 United States and the District of Columbia, 21 years of age or older. Legal residents of Canada (excluding Quebec) who have reached the aforementioned age in their province of residence at time of entry are also eligible to enter. The Sweepstakes begins November 13, 2018, at 12:01 AM (ET) through December 24, 2018, at 11:59 PM (ET). Limit one entry per person for Sweepstakes. The grand prize consists of a four (4) day, three (3) night stay at Planet Hollywood Beach Resort Costa Rica. Visit costarica.womenshealthmag.com to enter and see Official Rules for details.